I went out for a little while to catch a fresh breath of air with my mom and every old lady I would pass by would stare at my yellow shoes. Old ladies love them! So do I! They are my favorite shoes. If you know me, you will know that I love my yellow shoes! I wear them with everything. After a long day at the office, we went to Las Casuelas, and had some good food and laughs. I enjoy the company of my family so much. It’s been so rough to be without Jon, but they have really helped me stay positive. I don’t know how I would make it without their support. Thanks Loves! Then I went home and watched “The Social Network” with Magda and Eric. That was a good movie! Better than what I expected! I love movies about successful young people. They are inspiring. They make me want to do my homework! Yes, weird. I’ll stop talking about homework since I dedicated my last post to it. Yes, pure goodness. 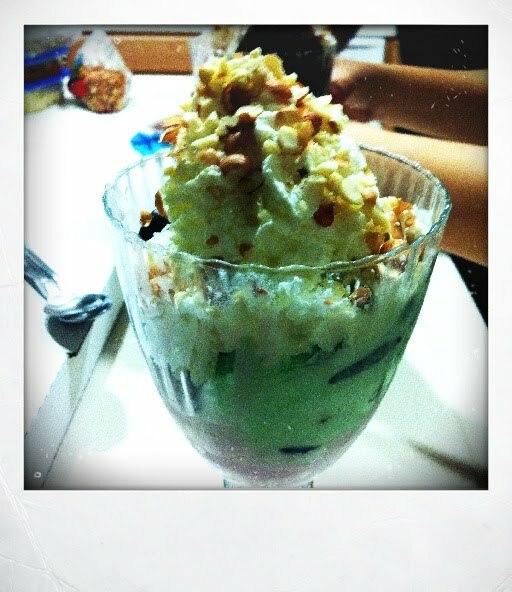 I call this Magda’s Epic Sundae. My sister can make a good anything! Well world, my day is now coming to an end. I hope everyone continues to have a great weekend. Goodnight!